Many years ago, when I was on the client side of B2B healthcare marketing fence, our messaging beat its chest. Mostly about how our product was bigger, better, faster, stronger and could make our customers more money. Years later, after time on the agency side of both B2B and B2C marketing, we’re seeing a massive shift in how B2B buyers at various levels need to be engaged. Sure, there’s a procurement officer that’s all about specs and cost. But we’re also assuming you’d like to move up the chain a bit. The bottom of the pyramid – where many B2B marketers stop. This is where no one wants to be – it’s commodity-land. Living on specs and price will not keep you in business. Neither will simply addressing your buyer’s economic or performance needs with features and functions. The middle of the pyramid – where sustainable and valuable relationships begin. Here, your messaging is centered around benefits that are important to the buyer. These benefits also enhance their subjective judgments about your product or service. Therefore, attributes like decreasing hassles and your expertise help you form this relationship. The top of the pyramid – deepen your relationship by engaging with a heartbeat message that speaks to personal and career related priorities. Your work here requires empathy and establishes trust. Will buying this product or service get me a promotion or better job? Or, will it get me fired – reducing anxiety can be a major point of emphasis here. 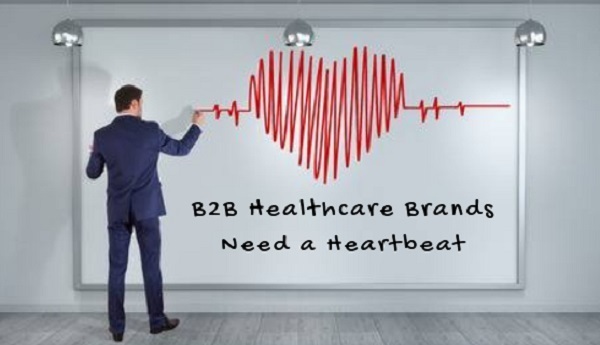 This is where adopting a key best practice from the B2C world can help differentiate and elevate your product or service above the rest of your B2B healthcare competition. Paying special attention to your buyer’s hopes, dreams, fears and aspirations will allow you to customize solutions/messaging to meet them. And this will also give your brand a heartbeat. A heartbeat will leave all the other brands, who lead with chest beat messages, in the dust. The tip top – addresses the elements that are critical to the future of an organization, enhancing the organization’s perception in the marketplace. You may have the opportunity to meet with the CEO of the company you’re selling to. Understand that everything beneath the tip of the pyramid is beneath them as well. The CEO is focused on the future of their organization and the attributes that will enhance its perception in the marketplace. Again, a heartbeat message resonates here; one that speaks to how your product or service aligns with their vision for the future or boosts their social responsibility, will put you in the driver’s seat.